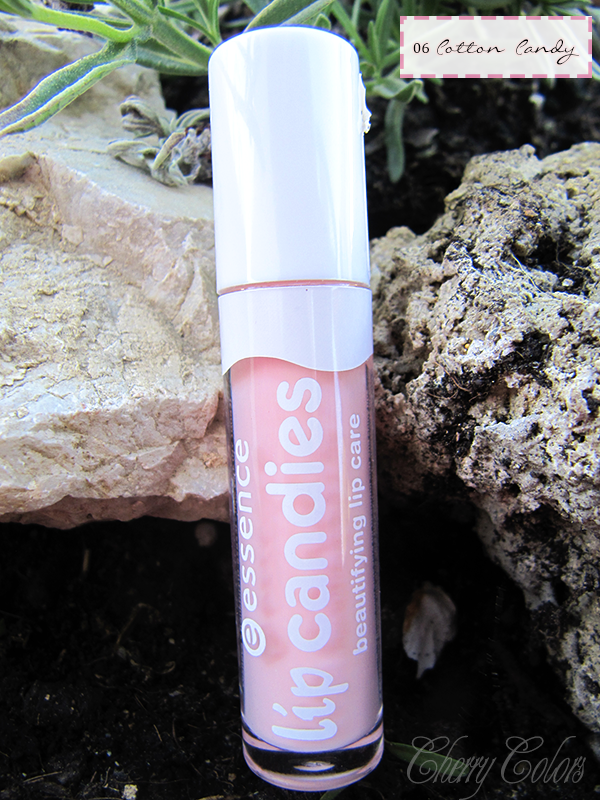 Review: Essence Lip Candies Beautifying Lip Care [Cotton Candy 06] - Cherry Colors - Cosmetics Heaven! I may have already told you, that I am not a fan of lip glosses. But I did become quite attached to the Catrice Voluminizing lip booster. I liked the hydration it offered and the tingling sensation on my lips (menthol). I used that one up and decided to try the lip candies from its sister brand - Essence. 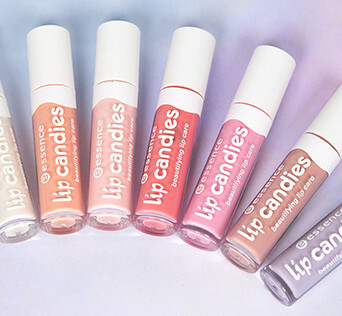 These lip candies look very intriguing - cute packaging and fun names. 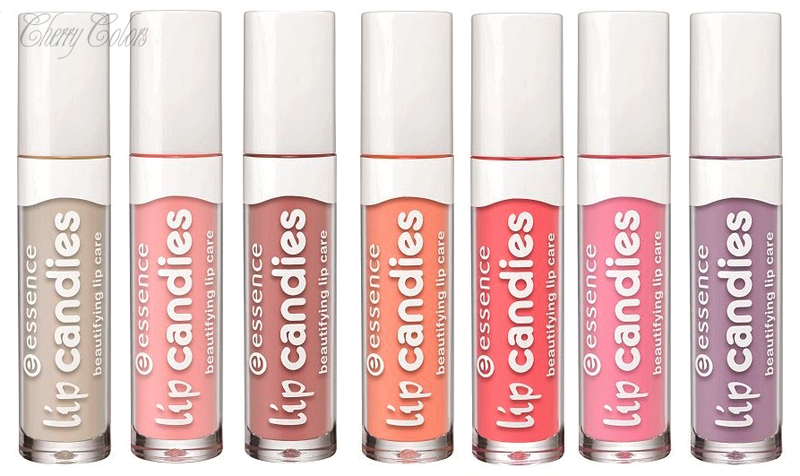 I was sure they are lip glosses, but Essence says no, they are a lip care product which pampers your lips. So basically it's a gloss that hydrates your lips. Lip candies come in 7 different colors and each of them looks lovely. I picked the shade called 06 Cotton Cady, because it looked the most neutral. The scent is lovely - very gentle, but artificial. For me it's not overpowering and it reminds me of cotton candy. I can't put my finger down on what exactly this scent is, but it is very gentle and you can't smell it on your lips (unless you, you know, pout). I can't really talk about the longevity of this gloss, because I like to eat and drink - a lot. Especially when I am in front of my pc, which is the only place I use this gloss. I think on me it lasts about 1-2 hours. Now, let's talk about the main problem with glosses - the stickiness. This one is sticky, but more like creamy - sticky, if you know what I mean? It's creamy and it's a tad sticky, hence it's a gloss. It doesn't make me irrationally mad about the stickiness, so it's alright. The only thing I don't like is the wand. It's hard and it doesn't pick the gloss nicely. Usually the wand gets soaked in gloss after a use or two, but this one doesn't! The gloss kind of lingers at the tip of the wand and that's it. That makes the application a tad problematic - if you like to use lots of gloss. I wish they'd made a softer wand. You know, like the amazing one from the Voluminizing gloss from Catrice! I like when companies come out with cute products, and I like it even better when these cute products are good. This hydrating (gloss) lip care product does its job at moisturizing my lips well, but I wish the wand would be softer and more absorbing. So I could apply way too much gloss on. I don't care about pigmentation, but this one gives some light pink (unflattering) pigmentation, when used a tad too much of it. I don't mind it, since I use it only at home, but outside - that may be a problem. Overall I am pleased. It's a product worth trying, maybe in some darker tones. Have you tried this Lip Care product? Your thoughts?